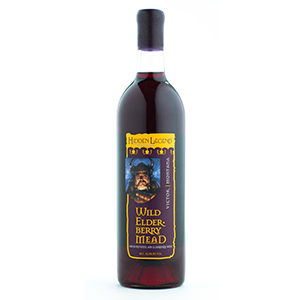 This delicious elderberry mead has a subtle port-like quality that makes it perfect for sipping and for complementing your favorite chocolate or sharp cheese. Elderberry wine was said to be the favorite of Hippocrates (the father of medicine) and the early pioneers of Montana. Best served slightly chilled. While I am a first timer to mead, this bottle when you drink as suggested was very flavorful. It was sweet with a tone of dryness to it. Took some getting used to at first, especially since I am more inclined towards sweets, but delicious nonetheless. This instantly became one of my favorites. I brought it out at a party and one of my friends got hooked on mead because of this and has already placed his own order! Also makes me think of Monty Python. The only thing that would make this better is if you actually could drink if from the holy grail. If you don’t mind or prefer drier mead and like elderberries, this mead is very enjoyable. The aroma that this mead has is pleasant, as is the presence of elderberries in the flavors. This was a very good tasting mead and I highly suggest trying it and several others. I ordered an assorted pack of four and was very pleased with them all. This was a really good mead, though not one of my personal favorites. It has the qualities of a dark red wine, like Pinot Noir or Port, and if you are not quite prepared for the robust flavor, it can throw you off. I’m not a big fan of red wines in general -which is why I gave it a four out of five-, but I have to admit that this was a very pleasant mead, so if you like rich robust flavors, give this a shot!